For information on the other menus of the Management Portal, see the Caché System Administration Guide. This section provides some basic terminology to help you get started. The process of managing Ensemble includes the following tasks, all described in this book. Purging old data that is no longer needed. Ensemble stores messages, Event Log entries, business rule log entries, and other historical data. It is generally necessary to purge old data periodically. Enabling or disabling the auto-start option for productions. This option causes a production to start automatically when Ensemble starts, and to shut down when Ensemble is stopped. 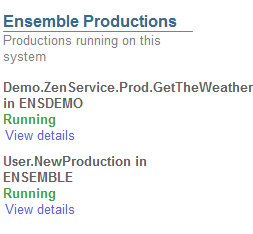 Creating and maintaining workflow roles and users, if any productions use the Ensemble workflow engine. It is also possible for supervisors (with sufficient permissions) to assign or cancel workflow tasks. Using the Archive Manager, which can archive messages to a separate archive. A newer, preferred option is to use the Enterprise Message Bank, which enables you to archive messages from multiple productions. See Using the Enterprise Message Bank in Monitoring Ensemble. Defining publish and subscribe message delivery. For information on monitoring the productions  viewing message queues, viewing the Event Log, and examining other such data, see Monitoring Ensemble. The Management Portal includes both Caché and Ensemble options. Ensemble is built on Caché, so all the Caché options apply equally well to Ensemble. The Ensemble menu provides options that apply specifically to Ensemble. Developers use the portal to configure and deploy new productions. System administrators use the portal to monitor or configure productions that are already running. Business analysts use the portal to define business rules for existing productions. You use the portal to start a production. However, if a production is running, it continues to run even if the portal is closed. That is, you can safely exit the portal and close the browser; these actions do not affect the current state of any productions. The Management Portal runs on all InterSystems supported web browsers. See Supported Web Browsers in the online InterSystems Supported Platforms document for this release for details. On Internet Explorer 9, do not use the Compatibility View. Click the InterSystems launcher in the Windows system tray and click Management Portal. In Studio, click Utilities, and then click Management Portal. Use a previously saved bookmark to this page. The title bar of the Management Portal provides a Switch command that you can click to switch to a different Ensemble namespace. Click an Ensemble-enabled namespace. For information about namespaces in Ensemble, see Environmental Considerations in Developing Ensemble Productions. If a production is Suspended or Troubled, see Correcting Production Problem States in Monitoring Ensemble.